LEARN MORE ABOUT BUSINESS SOLUTIONS BY CONTACTING ERIC BERTHEL AT ERICB@HHCU.ORG OR 860 9901256. HUG HUG HUG HUG HUG PLEDGING TO SHOP LOCAL, eat local, enjoy local and supporting your local businesses supports you and your community. As some would say, the mom-and-pop shop is the backbone of your neighborhood. There are more than 27 million small businesses across America. When you support your local business, you are supporting a dream. Every $100 spent at a local business returns $68 back to the community. But, the single most important problem for small businesses is their overhead, the costs they need to pay to keep themselves in business. Hartford Healthcare Federal Credit Union (HHFCU) puts their money where their heart is and supports local businesses in Hartford, Middlesex and Tolland counties. HHFCU offers low-cost, low-fee business accounts with options for savings, checking, credit cards, loans and a host of small business solutions. Size Up Your Business Discover how well your small business stands out among your competitors with the U.S. Small Business Administration's SizeUp tool. SizeUp can also help you map customers and locate appropriate advertisement opportunities. Learn more at SBA.gov. CELEBRATE AND SUPPORT LOCAL BUSINESSES AND THE DIFFERENCES THEY MAKE IN YOUR CORNER OF THE WORLD. 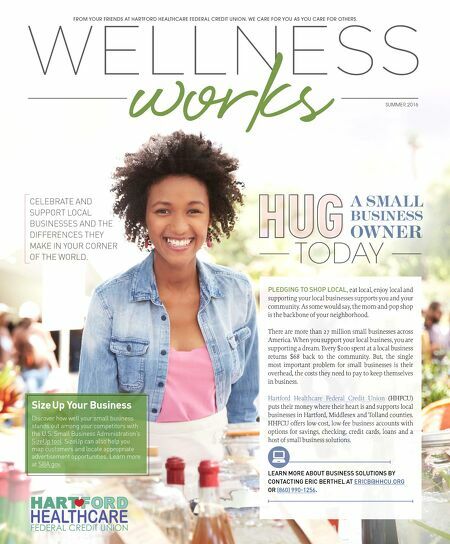 A SMALL A SMALL BUSINESS BUSINESS OWNER OWNER TODAY TODAY TODAY SUMMER 2016 WELLNESS FROM YOUR FRIENDS AT HARTFORD HEALTHCARE FEDERAL CREDIT UNION. WE CARE FOR YOU AS YOU CARE FOR OTHERS.